On the 2nd March Chris Turner and Mateusz Klesyk attended the East Midlands Grading at Ashby Ivanhoe club. Mateusz was previously ungraded and won 4 fights, displaying good techniques and style to rise four full belts to Green. 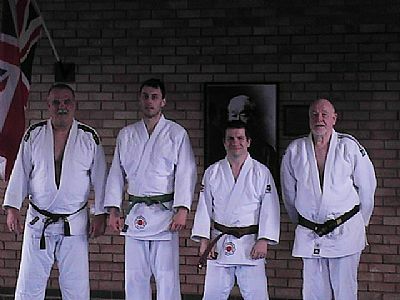 Chris Turner was graded at Green belt and won 7 fights by Ippon to rise to Brown belt. However, to complete their grades they needed to perform the Nage-No Kata. A sequence of 15 throws as set out by Kodokan in Japan, the home of Judo. This was done successfully at the Kodokan Club in Droitwich before the area grading officer, Dennis Roe. Dennis Roe 4th Dan (Area Grading Officer and Cheif Instructor of Rubery Judo Club).